Sony Exec: Indie Revolution is "Over"
SCEE's Shahid Ahmad believes that indie games have changed the landscape with "new ways of doing things." In the eyes of many, the rise of the indie game in recent years has been tantamount to a revolution of sorts, demonstrating to an industry enamored with the triple-A production values that, sometimes, small-and-different can succeed where bigger-and-better can't. Sony, in turn, has arguably embraced indie games in a way that other hardware manufacturer's haven't, putting their presence on PlayStation platforms front and center at major events like E3 and GamesCom. That said, if you were to ask Shahid Ahmad, head of strategic content for Sony Computer Entertainment Europe, he'd tell you that "the indie revolution" is "over." "People say the indie revolution is only just beginning," he said, speaking recently at the 2013 London Games Conference. "It's not. It's over." Far from this being a negative assessment, however, Ahmad simply believes that indies have already changed the industry enough that the old status quo no longer remains. "When the power structure shifts to the content creators, the old buildings might still be standing but there's new people in there. New content creators, with new ways of doing things." The job of the PlayStation brand, and Ahmad himself, in turn, has been responding to this altered landscape. This goal has led the company to embrace and adapt to what he believes are the three pillars behind up the proliferation of indie games: digital distribution, new competitors born from new platforms, and "power tools" like Unity and Game Maker which make it easier for developers to create content across multiple platforms. Sony's method of choice for dealing with the changes brought by indie games, according to Ahmad, has been to try and establish a good relationship with the emerging wave of developers. "In an era of massive fragmentation, the old rulebook doesn't work. Operating in an environment of trust was the only way to work," he said. "We've forged open and friendly relationships with developers - in fact our relationship with developers are better than they have ever been." The results of this push aren't hard to see, PlayStation platforms have become the arguable destination for console and portable indie titles, while its competitors are still, in many ways, trying to catch up. All that remains to be seen is if the company can maintain the dynamic that it's established in the long term. 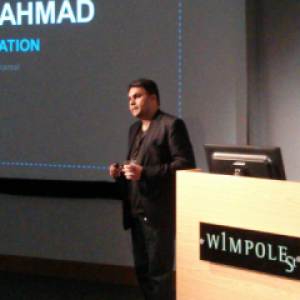 Ahmad admits that there still challenges ahead, especially when it comes to issues of digital distribution. "[We're] competing with a whole new bunch of players that had started in the digital era," he said. "Sony, Microsoft and Nintendo have one leg in the digital era and one in the physical, and we don't know when to step off the latter."